I believe travel to be one of the greatest learning experiences one will ever have. I was lucky enough to grow up in a family that believed this, too, so I was the fortunate recipient of numerous learning experiences (i.e. : trips) and valuable family time when I was young. Travel doesn't have to be extravagant to be fun and I've had many...unique...experiences while traveling! When I had my boys, there were many circumstances where we chose travel over more materialistic things that would eventually be forgotten and tossed away. The memories were much more important to us. During times when travel wasn't an option, due to financial circumstances or other obligations, I enjoyed reading about and dreaming of the places I might one day travel to. There's a lot to learn about history, geography, architecture and different cultures, that they don't teach in school the way that actually experiencing it can. So in 2003 the book called 1000 Places to See Before You Die, by Patricia Schultz, came out and was a NY Times best seller. The book was subtitled A Traveler's Life List and I couldn't wait to get my hands on a copy. My boys were still very young so most of the travel in the book would only be in my dreams for a while. Their "travel learning" would come soon enough. In the meantime I could dog-ear the pages I wanted to return to one day in this fabulous book, one of the first of its kind. 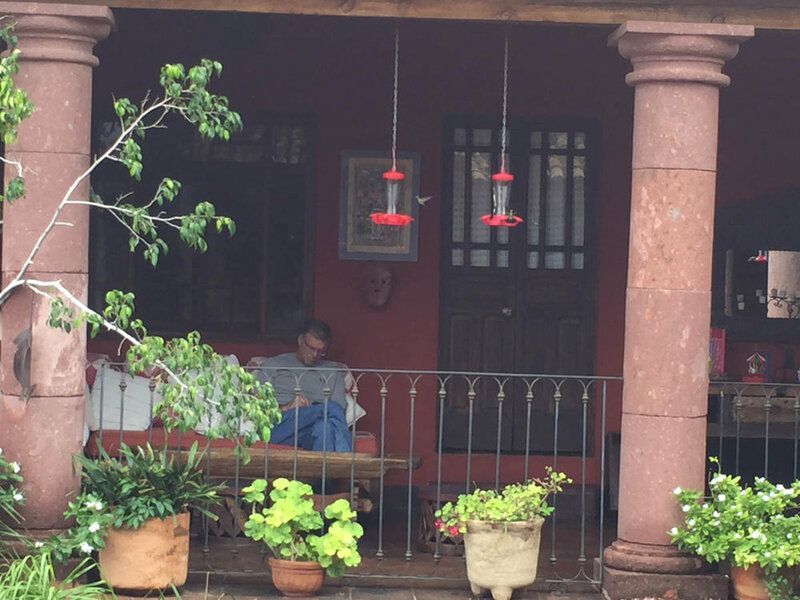 One place I had marked for years was San Miguel de Allende. It was touted as A Celebrated Artists' Colony AND a National Monument. Awesome! Art, crafts and history all in one! When I mentioned it to my fiancé he said it had always been on his list as well, so over the July 4th holiday, when most Americans were watching fireworks, we boarded a plane for our trip to Guanajuato, Mexico. 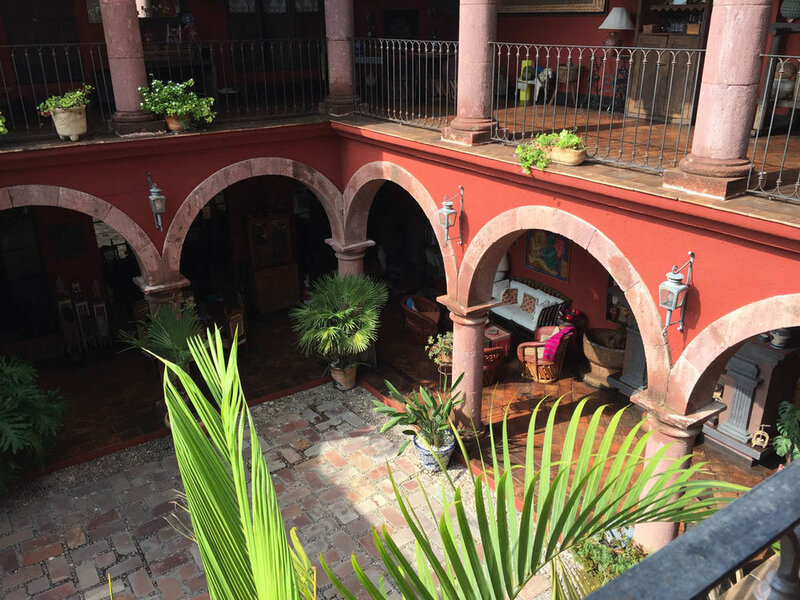 San Miguel de Allende isn't easy to get to from Colorado since it takes two flights to get to Leon BJX airport and then an hour and a half shuttle ride to the town. And if you're unfortunate enough to lose your luggage along the way (my fiancé), never to be seen again, you're in for an interesting four days. Luckily he's the most laid back, patient man I know and after spending one day shopping for ANYTHING for him to wear we determined that it wasn't the best place for a 6'3" man to find replacement clothing. Nevertheless, we had a great time experiencing all this charming little town had to offer and relaxing at our Bed and Breakfast which was an experience in and of itself. All the nooks and crannies, decks and terraces made it tempting not to even leave our property. 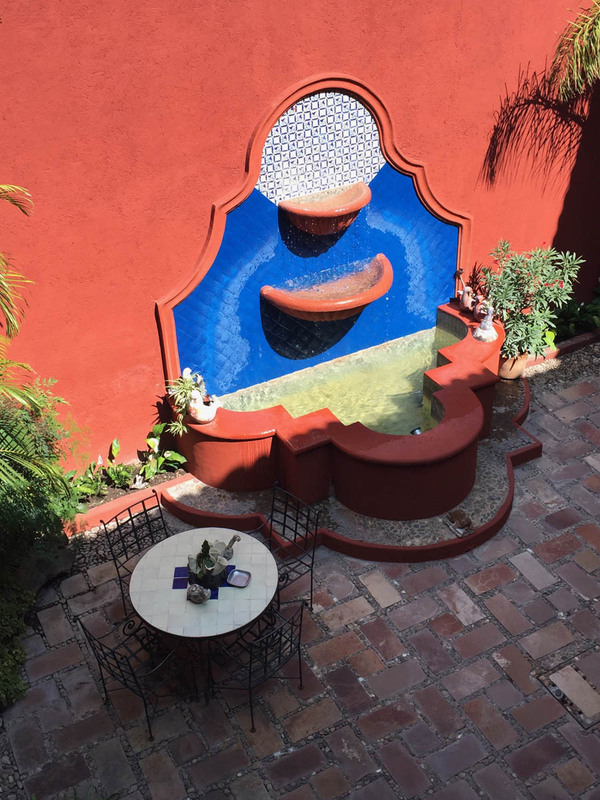 We stayed at Casa De La Cuesta and loved every minute of it. The breakfast was included and not to be missed! Our room had a fireplace which was so nice to have on a couple of the chilly rainy nights. 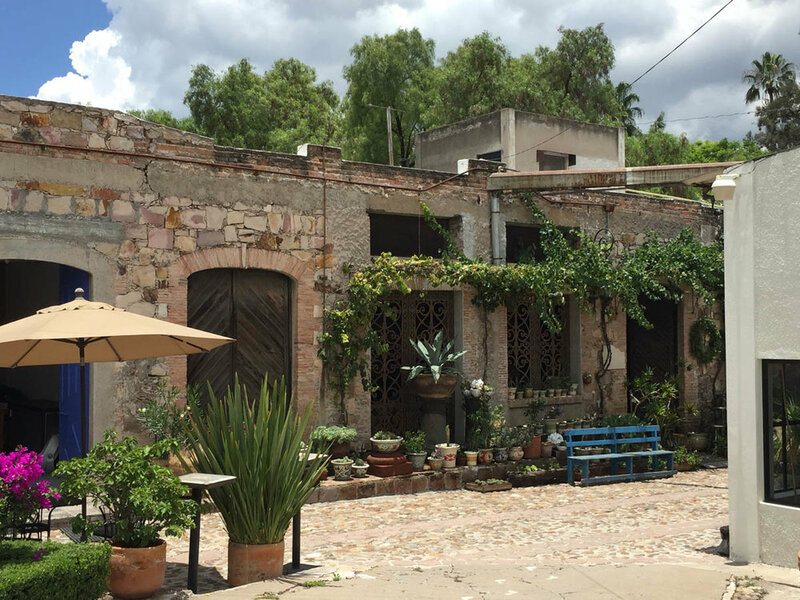 San Miguel de Allende is not the Mexico you may be used to with beaches and fancy hotels. It sits higher than Denver, so at 6200 feet above sea level you may notice being a bit out of breath as you climb stairs and walk up windy cobblestone streets. 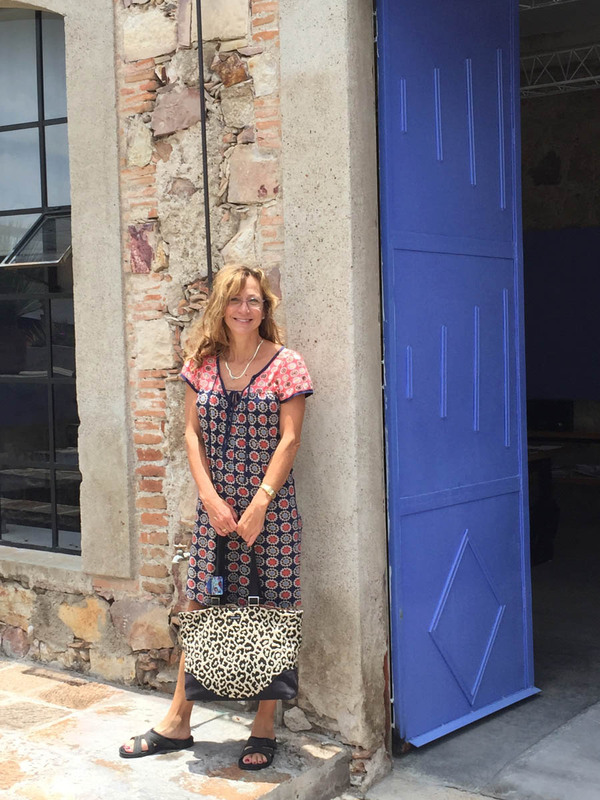 Even though it's touted as a "well-heeled, international, intelligentsia" crowd, I found it to be casual and I don't recommend bringing your dressy clothes and high heels. Brick or cobblestone streets are the norm which don't work well with fancy attire. Especially when your partner is wearing the same jeans and tennis shoes all day every day, with no other option! 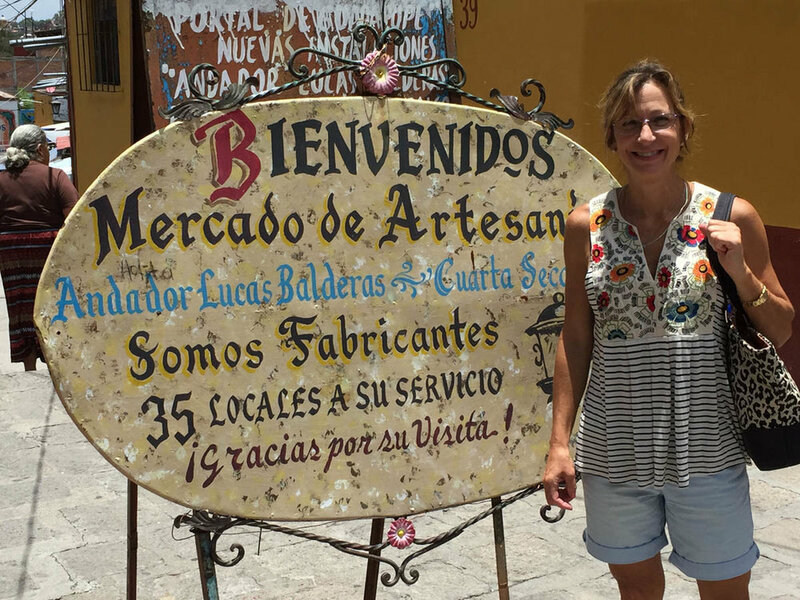 With so many unique art, craft and jewelry shops at every corner, it's hard not to fill a day wandering the streets and peeking in to see an artist's wares. Cafes are hard to miss as you walk the quaint streets and meet artists, chefs, tourists and locals alike. 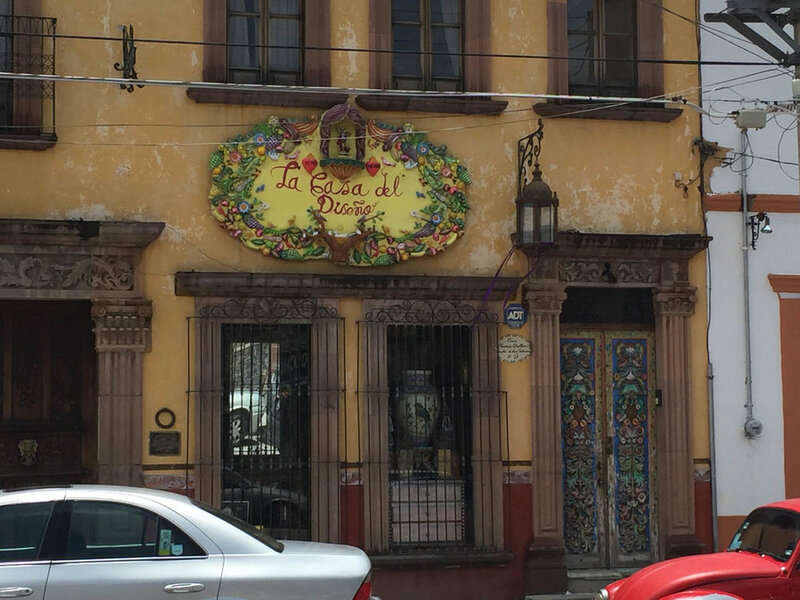 Wander the streets (no need for a car here) and you'll find little garden restaurants serving authentic cuisine, like mole, stuffed chiles and of course, margaritas! Colorful doorways usually lead to some fun gallery or restaurant so take a day or two to explore this darling city. Always a highlight for me is finding a market or craft show, and we happened to luck out and find a weekend arts and craft show where I wandered in booth after booth of shawls and scarfs. I purchased a lovely peacock patterned scarf that remains one of my favorite purchases. The colors in my scarf are deep and rich, making it a special addition to my wardrobe. Dozens of other interesting shops sold inexpensive handmade purses and bags, bedspreads and throws, and of course lots and lots of flowers! We were tempted to bring home lots of goodies from this city, but instead we soaked up the historic architecture and culture and found out why this town was named a world heritage site by UNESCO. You might also enjoy Italian Inspiration, Cottage Style Reigns: Beach Getaway Inspires Creativity, and other Lifestyle & Travel posts. We are a participant in the Amazon Services LLC Associates Program, an affiliate advertising program designed to provide a means for us to earn fees by linking to Amazon.com and affiliated sites. Yarn Scissors Silk has provided our honest opinion regarding this product; any fee earned does not affect your price but helps to support our site, and we thank you!